A pure blend of cold-pressed and organic rosehip oil which hydrates and supports healthy skin. Rich in vitamins, antioxidants, and essential fatty acids, rosehip oil is renowned for its anti-inflammatory and regenerative properties. This silky oil helps to calm redness, hydrate dry skin, treat scars and burns, brighten skin, and regenerate damaged tissue. How to Use: Apply a few drops to your face at night after toners and other water-based treatments. 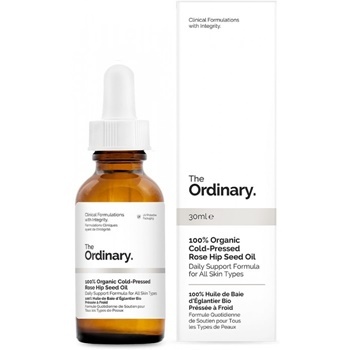 I love using this oil right before bedtime as it makes my skin feel so radiant and plump the next day! I have been using this for about 2 months now and have noticed that my acne scars have disappeared and lightened. Also a bonus that this product is organic!